Nana Yeboaa is the pen name for Bernadette Poku. 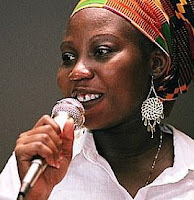 She is a spoken word artist and performance poet. Some of her poetry material have apperead in the Taj Mal anthology, T.dot griot: an anthology of toronto black story tellers. 1. You've mentioned that this was one of the first poems you wrote after immigrating to Canada. Was this a coincidence, or do you think you could have only written it at that time, experiencing the changes induced by the move? I really do believe that my immigration to Canada offered me the opportunity to look at my culture, to look at things that I had previously accepted as OK. I began to look at the sacrament/institution of marriage and my identity as a person (woman) of color differently. I began to be critical of the attitudes of men who traveled abroad to further their education, the changes in ideology that they brought with them, and the perceptions they held about the African women they left behind. 2. When you write a poem like this, who is your intended audience? Ghanaians? Canadians? A small group of readers or a wider audience? When I write, it is with an innate feeling that it is directed to all of humanity, hence I do not write for a particular audience. It is the core truth of my feelings, hence I am not subject to mince words. So everyone is to read and form an opinion, learn a lesson perhaps or create an avenue for debate or discussion. For instance, a black woman may agree with me, some black men may critique, vehemently disagree with the issue or condemn the piece, whilst some white women may feel insulted. But mind you, the talk's about some black women’s reality in a different age, time and growth of the African sub-continent. 3. How do you think the prejudices of the husband in this poem (racial stereotyping of spouses, dismissal of traditional medicines, etc. ), which are so omnipresent in our world, be fought? How would tactics in fighting these prejudices be different in a country like Canada than in a country like Ghana? This is when the notation "yea men of little brains" come to my mind. The husband as the poem portrays is a well read man, however he is a person lacking asense of tradition, like a duck that thought it was a goose. Such a person frowns upon tradition as being uncouth, uncivilized. Need I say that when we talk about native/traditional medicines, pharmaceutical companies have benefited a lot from what we frown upon as healing and living promoting roots, herbs and cures? Medicinal ‘discoveries” aren’t discoveries since they have been in use for centuries by people of African, South American and Asian decent. Regarding racial stereotyping of spouses in the poem, I can speak to it within the context of loss of identity/fear of confronting one's own identity. Partly colonialism is to blame for the creation of the impression that anything/anyone who is not of the Caucasian race are inferior. Now this ideology is not impervious to the black woman who needs to compete by bleaching herself to become white in order to please the husband. Me broni (my white one). In order to fight such prejudice there needs to be self awareness, a sense of value in society, and an acknowledgement that we all bring something positive to the world. Fighting this kind of prejudice is what the spoken word movement is all about in Toronto. Learning from each other the essence of being a person of color. What it means to be a person of color in Canada and an immigrated person of color? Both populations have our differences as well as our similarities. The core of the matter is identifying who we are, who we want to be and setting the course for achievement, the proclamation to the world of our need and purpose in society. Education and patience are invaluable tools in the fight. Prejudice in Ghana is another subject altogether. I am unsure where to start but then it comes down to economics of living, the earning gap between men and women. It is difficult for women to be assertive in a society that is so patriarchal. 4. Of late, polygamy has been a hot-button issue here on OGOV. Do you think poetry can aid in the discussion of the merits of polygamy, or will it only inflame one side or the other (or both!) and not really help sway opinions? Polygamy in a previous era, served its purpose, presently, it does more harm than good. There is a time for everything and certainly the age of polygamy is coming to an end in many countries (but there are exceptions). 5. Could you tell us a bit about the African poetry and spoken word community in Toronto - what's going on and how interested individuals could become involved? I wouldn’t specifically say African poetry in Toronto, but the general spoken word scene in Toronto is comprised of dub poets of Jamaican decent, a few African (motherland) poets and other nationalities. I will list a few that I have had the pleasure of being onstage with: J. Nicole Noel, Al St. Louis, Motion, Rudyard Fearon, Queen Tiyessential, JD, Hajile, etc. Trane Studio has open mics; the art bar is one of Canada’s longest running poetry bars in Toronto, and torontopoets.com is a great resource. Afro Fest in July also has a spot for poets to perform or enjoy poetry. I am a man, Sierra Leonean, living in Germany, but I like your OUTLOOK. Nice, keep it up. This will give some men something to think about, but as a man, like I said, I have a woman, but she is beautiful in all TOTALITY. Everythiing about her is super, just super.She is what I will call an Embodiment of Womanhood. She does not only have great brains, but she is the sexies woman in the world. Everything in place. She is not just a figure 8, she is a figure SUPER, for me. Other men might go searching for the Perfect, but I still believe and respect one thing in this saying.....Beauty is in the Eye of the Beholder.